Starting with frequency, it’s probably not that surprising that globally 54.7% of the over 55s have never watched pirated content. In fact, the highest percentage is in North America where 86.4% of over 55s said they’ve never watched pirated content. This is compared to only 24.9% of the global 18-24 age bracket who say they’ve not seen it. But of the global over 55s that are indulging in pirate content, 12% watch it more than once a week. Not so far behind the 18-24 age group at 18.9%. Of all the regions, Western Europe has the highest percentage of consumers watching pirated content more than once a week: 28.2% (18-24) and 17.6% (over 55). When it comes to devices, globally over 50% of consumers use their laptop for watching pirated content: 54.7% (18-24) and 57.7% (over 55). However, it’s the shift of viewing habits to mobile devices (Android/iOS smartphones and tablets) that is interesting. You’d expect the Millennials to be the runaway winners. But not in all regions. Globally, 26.9% of 18-24s prefer to watch pirated content on mobile devices; compared to just 13% of over 55s. Yet, the over 55s in the Middle East seem to have millennial tendencies with 30.9% using mobile devices for their pirated content and 37.6% for the 18-24s. Although not included in this survey, but based on personal experience of my 3 teenagers viewing habits at home, Generation Z will undoubtedly increase the mobile device percentages going forward. What does it mean for pay-media operators? As the use of mobile devices for watching content is increasing, implementing OTT watermarking is a key step in protecting your content. Not only is watermarking a requirement for MovieLabs ECP but we are seeing that sports rights owners are also demanding more stringent protection. The power of watermarking comes when it’s combined with detection, enforcement and investigative services. The detection service allows you to trace the source of the leak and implement counter measures such as immediate shutdown of pirate sites. Proactive enforcement and investigative services are aimed at identifying and prosecuting the parties involved in large commercial streaming piracy networks. In addition, pay-media operators should ensure that they are offering quality content with affordable options for all their consumers. Particularly for the Millennials and Generation Z who are the consumers of the future. With 52% of the global survey respondents watching pirated content, the survey has confirmed that online piracy needs to be taken seriously. 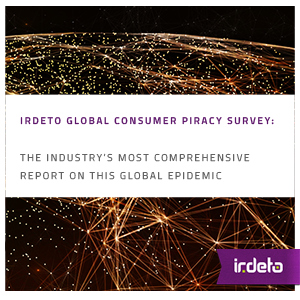 For more information about the global consumer piracy survey click here. This entry was posted in Media & Entertainment and tagged ECP, Irdeto, MovieLabs, online piracy, OTT, pay-media, pay-TV operator;, watermarking. Bookmark the permalink.